Christmas come early in LA! While working at my favorite coffee shop – Coffee Commissary, I looked up to see this gem sitting in front of me outside. This rocker was donning one of the most impressive Canadian Tuxedos ever. 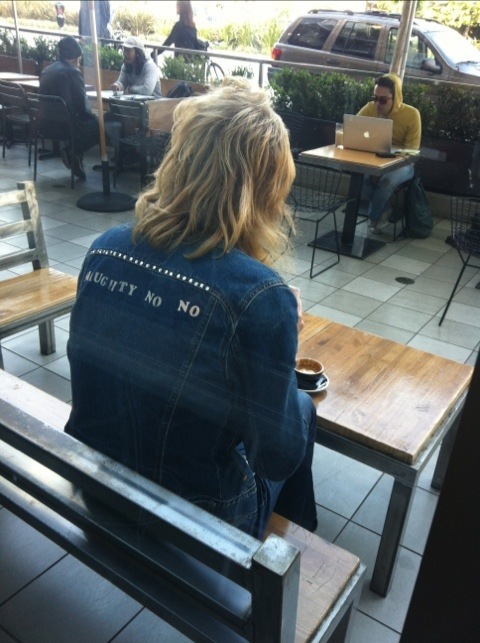 Love the bedazzled “Naughty No No” denim jacket. This entry was posted on Tuesday, November 15th, 2011 at 2:50 pm	and tagged with Canadian Tuxedo, Coffee Commissary, Fashion, Jeans, Los Angeles, Vintage, West Hollywood and posted in In The Wild. You can follow any responses to this entry through the RSS 2.0 feed. « Cody Simpson Doll in a Canadian Tuxedo!